BARCELONA: Andres Iniesta confirmed on Friday he will leave Barcelona at the end of the season, bringing the curtain down on a phenomenally successful career at the club, but said a move to China is yet to be finalised. 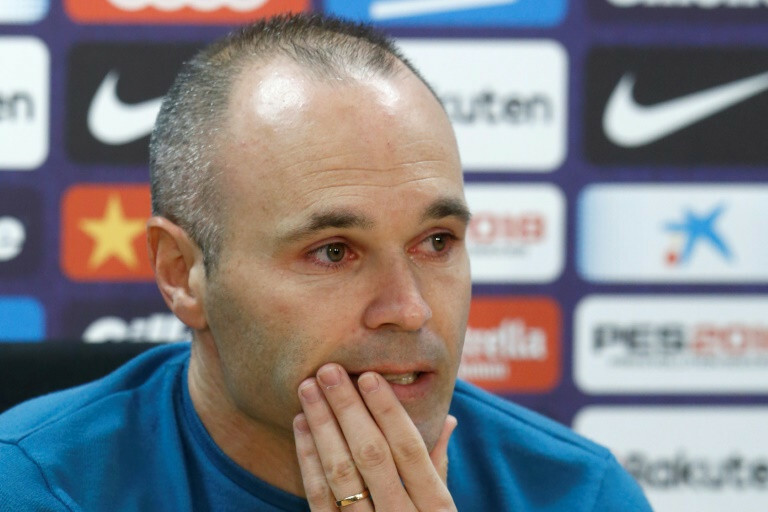 In a press conference attended by members of the first team and the club’s board, Iniesta said he wanted to finish at Barca “feeling useful, feeling important and still winning titles”. Iniesta is expected to continue his career at a club in the Chinese Super League but remained tight-lipped on his next destination. The 33-year-old revealed only that it will be outside Europe, reiterating he would never play against Barcelona. After joining Barca’s academy, La Masia, aged 12, Iniesta blossomed into one of the Catalans’ greatest ever players, winning four Champions League and eight La Liga titles, and lifting the World Cup with Spain. “If I had imagined finishing my career here, it would have been like this, feeling useful, feeling important and still winning titles. Iniesta’s short speech was greeted by applause and the congratulations are likely to continue on Sunday, when he can collect his ninth La Liga title. Barcelona need only a point against Deportivo La Coruna to be crowned champions. It would secure a domestic double in Iniesta’s farewell campaign, after a thumping win over Sevilla clinched the Copa del Rey last weekend. Iniesta capped a typically elegant performance at the Wanda Metropolitano with a wonderful finish, shimmying past goalkeeper David Soria and tapping in his 57th club goal, on his 669th appearance. He would not be short of suitors this summer among the world’s elite clubs but Iniesta, who already has an offer from China, will not be staying in Europe. “There are things to talk about, things to finalise,” Iniesta said. Among those likely to be disappointed is Iniesta’s former coach Pep Guardiola at Manchester City, who has reportedly tried to push the merits of a move to England. Guardiola’s Barca team, which won La Liga three times in a row between 2009 and 2011, as well as the Champions League twice, enjoyed Iniesta at his mesmorising best. During that period, Iniesta became the poster-boy for fluid, possession-based football, for which this decade of Spanish dominance will be forever remembered. He would have won the Ballon d´Or in 2010 but finished second to Lionel Messi. A glorious farewell with the Spanish national team is also possible at the World Cup this summer, after which Iniesta is expected to call time on an international career that has included winning the World Cup in South Africa in 2010, between consecutive successes at the European Championships in 2008 and 2012. Iniesta’s succession will not be easy, particularly for Barcelona, whose original ‘tika-takas’ are now down to Messi, 30, Sergio Busquets, 29, and Gerard Pique, 31. It is hoped Philippe Coutinho, bought from Liverpool for 160 million euros in January, can help fill the void.